A terrified couple were forced to drive their car with a giant, deadly snake under the car bonnet. 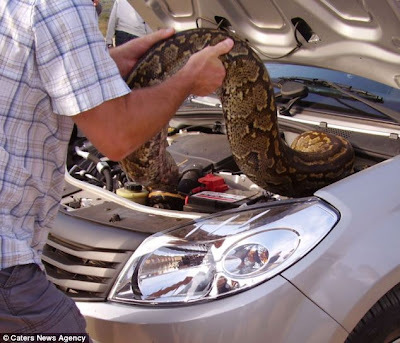 Marlene Swart and Leon Swanepoel watched on in horror as they saw a 16 foot python slither through the grass and up underneath their car bonnet while they were on holiday in Kruger National Park in South Africa. The couple from Brits in South Africa were looking out for lions when they came across the python just before it disappeared under their car and settled on the engine, refusing to move. Ms Swart, 38, and Mr Swanepoel, 51, were then forced to endure a three mile journey to a nearby lookout point with the python in tow. Ms Swart said: ‘It was certainly a once in a lifetime experience that we will never forget. ‘I was totally in shock and terrified. 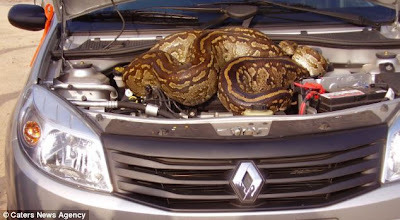 ‘When we spotted a couple of safari vehicles on the road we thought it was the lions we were looking for but we were informed there was a python in the grass. 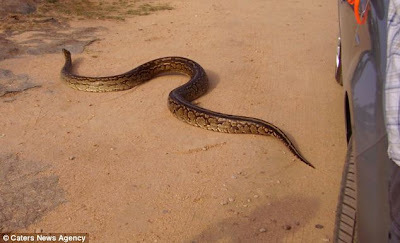 ‘While we were searching the snake suddenly sailed out of the grass directly in our direction. ‘I waved to the vehicle behind us asking him to reverse but he didn't realise what was going on. At the lookout they built up the courage to open the car bonnet. 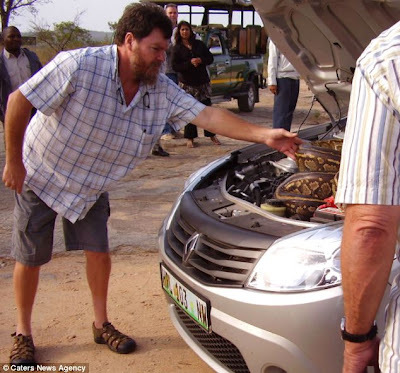 Ms Swart said: ‘When we eventually opened the bonnet the snake was just relaxing on the bonnet watching all of the commotion around him. 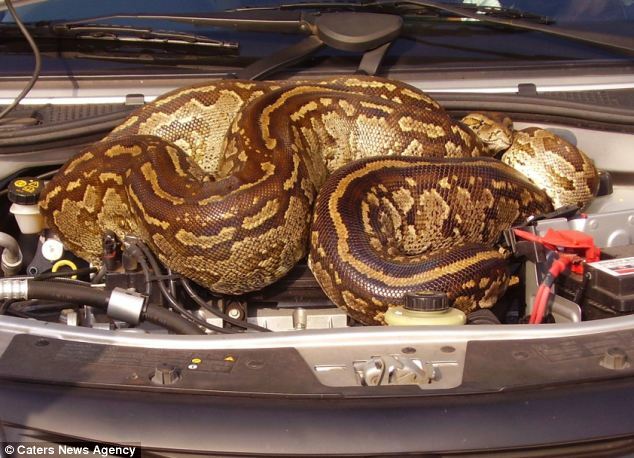 ‘It eventually sailed away unharmed and luckily there was no damage to the car. ‘Later that evening we had a good chuckle about the reactions of the bystanders when it exited the vehicle.